Juhani was a Cathar female and a Knight in the Jedi Order during the Jedi Civil War. 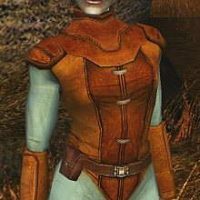 Juhani grew up on the planet Taris after her family escaped the assault on their homeworld during the Mandalorian Wars. In addition experiencing great hardship and xenophobic discrimination, Juhani was sold into slavery after the death of her parents in order to pay off their debts. Juhani was eventually discovered to be Force-sensitive by the Jedi Knight Revan, and freed from her servitude. She then made her way to the Jedi Enclave on Dantooine and was accepted for Jedi training by Jedi Master Quatra..
1. Teal matte body suit. Body suit must not be baggy or have any visible closures. The only skin that should be visible are hands and face. 2. Leather or leather-like medium browns vest, hip length. two center front panels taper down the front, wider at the shoulder than the waist with a center front closure in the darker medium brown, clasped with three thin metal clasps silver or light gold in color. There are two lighter brown side panels and a single knee-length ‘tail’ panel in the back in the darker medium brown. There must be an accurate layered collar piece with no center front seam and a high, rounded collar. 3. Leather or leather-like ovular shoulder pauldrons with rounded tube-like edging and two decorative panels on top. Pauldrons should match the darker color(s) of the vest. 4. Leather or leather-like arm guards with rounded rectangular decoration on the forearm extending from the elbow and stopping short of the wrist. 5. Knee-high boots, spats, or boots/spats combination in the same color as the vest. Boots should have heels no higher than 2 inches (5 cm). The back of the leg should have ribbed-looking texture while the front should appear leather-like. There should be four thin straps of a slightly darker brown color across the back of the boot leg without visible clasps. 6. Thin brown leather or leather-like belt with a rectangular shiny belt buckle (silver or light gold color). One brown leather or leather-like belt pouch on the right hip. The belt and pouch should be a darker brown color. 7. Lightsaber; blue/cyan colored blade if blade is present. 8. Head must appear to be bald except for a high ponytail. The ponytail should be held up with a metallic gold wrapped cord or stacked gold rings at the base. Ponytail hair should be separated into many thin braids, no fewer than 8 individual braids. Each braid should be tipped with a long, cylindrical gold bead. Natural hair colors only, black or dark brown recommended. Bald caps, if used, must be applied neatly and should be made up naturally so as not to look obvious. 9. Brown tabby cat stripes on the front and back of the head in either makeup or imitation fur. 10. Costumer should wear slightly pointed ears. Ear tips should match the costumer’s skin tone and applied neatly with makeup so that seams are not obvious.